eNet-1553-EBR™ is an innovative product that provides real-time Ethernet connectivity for up to eight RS-485 10 Mbit EBR 1553 RTs: 1553 EBR to Ethernet Converter. 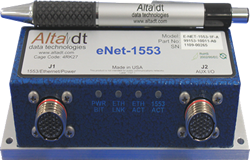 Alta has adapted the industry’s most advanced 32-bit 1553 FPGA protocol engine, AltaCore™, for 10 Mbit 1553 EBR (Commercial Standard SAE AS5652) with a real-time IP/UDP thin server in a small low-power, rugged box (ENET). The customer can implement their application with the same feature-rich application programming interface, AltaAPI™, as used with standard 1553 cards – the ultimate in code portability. 10/100/1000 Ethernet Converter to EBR 1553 AS5652 Link and Spec Modes. BC, 8-RT, BM Single Function. ENET-1553-EBR™ is an innovative product that provides “remoting” of 1553 AS5652 EBR operations on 10/100/1000 Ethernet IP/UDP local area networks (LAN). ENET-1553-EBR is a small, low-power, rugged device that provides connectivity for up to eight AS5652 RT devices, single BC or composite monitor. Alta has combined the industry’s most advanced 32-bit EBR FPGA protocol engine, AltaCore™, with a real-time IP/UDP thin server. The customer can implement their application with the same feature-rich application programming interface, AltaAPI™, as used with standard cards – often without even recompiling – the utlimate in code portability. **NOTE: ENET-1553-EBR (server) is a real-time Ethernet/EBR devices, but your computers’ (client) IP stack may not be! The ENET-1553-EBR device provides real-time UDP receive and transmit requests to EBR buffers, but the client’s IP/UDP stack will induce path delays as compared to backplane cards. For many applications (<100-1000 packets per second), this product will provide unparalleled flexibility in EBR configurations (much better than USB devices). . Contact Alta for test results on various OS and computer configurations – your system results may vary. Here you can find documentation pertaining to the ENET-1553-EBR. For additional documentation and software, please visit our secure download area.